description for "Winter Squash and Pumpkins: Cucurbita moschata, 'Tahitian'"
Cucurbita moschata 'Tahitian' is prolific, with great flavor and the highest sugar content of any of the winter squashes. Tender golden/orange flesh. 'Tahitian' is delicious raw in salads, or baked. Mildew-resistant, good for warm climates and long growing seasons. Giant, smooth, club-shaped fruits. Sow 2-3 seeds every 3-4 feet in rows 3-6 feet apart when danger of frost has passed. Thin to strongest plant. Can be sown indoors, 2-4 weeks before last frost, and transplanted very carefully. Harvesting tips. Pick before frost when stem cracks and skin hardens. Cure in sun for 10 days, or indoors at 85ï¿½F for four days. Can grow up to 30 pounds! Planting depth: 1 inch. Days to germination: 3-7 days. 110-180 days to maturity. 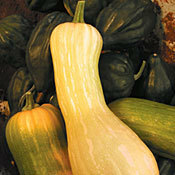 reviews for "Winter Squash and Pumpkins: Cucurbita moschata, 'Tahitian'"